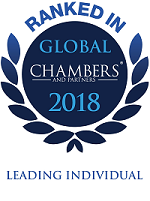 In the recently published 2018 edition of Chambers Global, a leading global law firm directory published by Chambers & Partners, Kim & Chang was the only Korean law firm to receive “Band 1” rankings across all eight practice areas surveyed. Additionally, our firm was once again ranked "Band 4" for International Arbitration in the Asia-Pacific region, and recognized for our country-based expertise such as "Corporate/M&A: Foreign Expertise for China" and "General Business Law: North Korea." For individual rankings, a total of 34 of our attorneys were recognized, up 4 from last year. 28 received "Leading Individual" recognitions, and six were named as "Other Noted Practitioners." 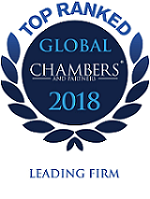 About Chambers Global and Its Methodology: Chambers Global is an annual global legal ranking directory put out by the leading legal publisher Chambers & Partners. It conducts independent research and analyses to determine the most outstanding law firms and lawyers from more than 190 countries. * A "Star" ranking is given to lawyers with exceptional recommendations in their field. ** A "Other Noted Practitioner" handles notable matters and / or has received some recommendation during the course of our research. However, they have not received a sufficiently high level of sustained recommendation to be included in the printed version of the Chambers guide. Instead, the "Other Noted Practitioner" category shows that these individuals are on our research radar.